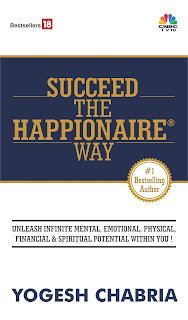 Yogesh Chabria - The Happionaire ​Blog - Best Motivational Speakers In India - Inspiration, Success: Do You Just Want To Be Average? Do You Just Want To Be Average? After our last post on Mutual Funds and Insurance, I got several e-mails and comments from fellow Happionaires as well as from people in the insurance and mutual fund business. Many agreed and shared their experiences on how they lost out in the past while a few others opposed my views as radical and not practical for people who might not be having the same skills as a professional investor might be having. All those who read this need to realize that what I am saying is not meant for everybody – but only for those people who have a desire to create immense wealth. If someone is going to be satisfied with just ‘average’ returns than they can go on and do what the masses do. Did Rakesh Jhunjhunwala or Warren Buffet get rich by investing in Mutual Funds? I never speak from an ‘academic’ or ‘theoretical’ perspective, because I didn’t learn to invest that way. I learnt on the streets and I continue to learn there every single day, I’m not someone who went to IIM, IIT or Harvard. Irrespective of if you went there or didn’t, the streets will always teach you more. I could have never made the same amount of returns had I invested in a Mutual Fund or parked my money in some complicated insurance linked to investment plan. Wealth is created by making the best use of whatever resources we have. I respect what Mutual Funds and Insurance do for the larger markets as the get liquidity, but on a personal level I will never invest in them. Insurance is a means of security and the best thing to do is just take a term insurance where you pay a nominal amount every year – if something happens to you, your family gets the money. But better than this is to build up your long term capital – so your family stays protected with hard liquid cash. Try claiming money from insurance – even for a simple thing like medical insurance and you will realize how much difficulty they create for you to get your own money. If you have Rs. 5 crores locked up in an FD, do you think your family will need to worry about things like insurance? That is what you should aim for. Recently I got an e-mail from a fellow Happionaire and I had a big smile on my face after reading it. He had Rs. 25 lakhs a year ago. He wanted to take an EMI and buy an apartment worth Rs. 50 lakhs, however he decided not to after reading our negative views on real estate and our opposition to becoming an EMI slave. Instead he decided to invest Rs. 10 lakhs(Earlier typo:Rs. 5 lakhs.) of his capital in Satyam when the stock had crashed to Rs. 11. He did that because he worked in IT and understood the business model and also was willing to lose his entire Rs. 10 lakhs. He knew that if his bet worked – he would create extraordinary returns, and by the grace of God it did. He sold out recently and grew his capital from Rs. 10 lakhs to over Rs. 1 c in less than a year. He used the principles of Cashing The Crash and benefitting from times of crisis. While the entire media and analysts were talking against it, he had the guts to do what very few did. Could he have had investing in a Mutual Fund or a Unit Linked Insurance Plan? Could he have done the same had he been an EMI slave and taken a loan to buy a property? Would he have had the same freedom in life that he enjoys today? There are several such opportunities that the markets keep offering us and it is our job to make the most of them. Don’t regret the past – but at the same time make sure you don’t miss out on the future. I can guarantee that anyone who invests today in the right assets will create immense wealth and those who get carried away by hype will end up losing immense wealth. Which side do you want to be on? I think I know which side you really want to be on. Eye opening and inspiring to hear about a fellow Happionaire creating so much good returns thanks to your hidden messages and advice. I too read your book and felt a strong connection from my heart to lots of hidden messages. I invested in Indian Hotels as suggested and made 120% returns and it makes me smile also thanks Sir. You are our real GURU. Just before going to sleep I decided to check your blog and found this very positive and inspiring post here. I also work in an IT company and I also had the same thought to pick up Satyam that day when it crashed so much, but somehow I was watching TV and got carried away and didn't listen to my heart. I had Rs. 1 lakh to risk, had i done that today i would have rs. 20 lakhs but as you say sir destiny and not to regret the past made otherwise good returns compared to mf and fd. have also sent e-mail please reply when you get time really want to know how to invest with you. I am really surprised to read Satyam stock price quoted at Rs.11. may I know when it was, I checked the prices for the past 1 year and could not see it going to 11rs. Also I am wondering how the Anonymous commenter could have possibly made his 1 lakh to grow to 20 lakhs as he claims. That guy invested 5,00,000 in Satyam at Rs. 11/- that would mean 45455 shares. Even if he sold it at 130/-; it means 59 Lakhs. You mentioned 1 Cr. ; i am really curious how come since there was no bonus, no split from till then. No regrets; no pointing just a simple thought. May be I am doing some wrong maths here and the thoughts you presented are true for different selling valuations. I think the low touched on Satyam was Rs. 6.50 or 7 on NSE. No there was no bonus or anything on it. Either he might have picked it up lower or he might have put more money. Ravi I never got the chance to thank you for the wonderful stories you had shared in the past. So will do that too. To be honest, I still don't feel that everyone can have the same skills when it comes to investing. It takes lots of time and hard work to reach your level or the level of people making good money, but I know once we reach there it is much more beneficial. i think you dont know how to check historic prices and charts. Satyam touched low of Rs6.5 but sustained at 11-12 for half hour aprox. i bought 4000 shares @ 13.20, amazing returns......another good opportunity i got after satyam was GAMMON INDIA when delhi metro bridge fall and people got bearish in that stock gave wornderful opportunity to enter me........... you be active and you will atleast get 1 such opportunity in an year to make killing returns........ M.yogesh is showing rite direction by publishing books but people how dont want to learn was suspecting how GOLD will reach such heights. i think getting so valuable knowledge for free is not working for lot of people, but i had made good profits not only exiting mutual funds but trying to learn how one can cash every crash. Thanks to Mr.yogesh for such wonderful and eyes opening articles. wow.. what an article.... truly commendable yogesh Ji. I agree with you 100%. People who dont have time to create wealth will go for funds so that the inflation is not eating up their money and grows a bit too and it needs sense and sensibility to create wealth, which can cannot be gained over-night. Thanks for the knowledge. I myself saw the opportunity and missed the bus by not having the guts to buy Satyam. yes, i too invested in Satyam but not when it was at its lowest..
Safest bet was to invest in in when government had set up a panel of people like Kiran Karnik and Deepak Parek..
Insurance is the best Investment, if your insured Uncle dies early ,and you are the beneficiary..
About average returns I would like to say one thing For the last 50 yrs people have been reading about Mr buffett, but we have had only 1, Yogesh is doing a great job, I also tried doing the same but no one would listen so then I realised one thing that the world has been running like this for the last 200 years, and probably run like this for the next 100 years, that means in my lifetime, so I decided to concentrate on my education in investing and am looking, that does not gaurantee success, but there are better chances, to be successful if you look after yourself, the world will take care of itself, and any how if we look at the wealth pyramid for the last 2000 years, its only that a few people are rich at the top at the expense of the people below, so i would suggest keep trying, because who knows what luck has in store for each one of us, it is likely that someone from us may grow very big, som may do very well and some will not, but one thing I am sure of the street teaches you more than anything else, and a psychiatrist is likey to do better than a iim graduate in the real world because it is much more important to understand how the majority behaves. It is important to remember to make money in dharmic ways.There are lot of people in India(especially some politicians) who make a lot of money in not so correct ways.Take the case of former CM of supposedly one of the poorest state in India-Jharkhand.He has assets in swiss banks and has invested in mauritius,thailand etc. I do not want to be at top of pyramid by earning in such ways! Ok, Thanks Kunaal and other happionaires for appreciating my stories posts. Thanks to yogesh for correcting the typo of 5L to 10L. In ancient times, a king had a boulder placed on a roadway. Then he hid himself and watched to see if anyone would remove the huge rock. Some of the king's wealthiest merchants and courtiers came by and simply walked around it. Many loudly blamed the king for not keeping the roads clear, but none did anything about getting the big stone out of the way. Then a peasant came along carrying a load of vegetables. On approaching the boulder, the peasant laid down his burden and tried to move the stone to the side of the road. After much pushing and straining, he finally succeeded. As the peasant picked up his load of vegetables, he noticed a purse lying in the road where the boulder had been. The purse contained many gold coins and a note from the king indicating that the gold was for the person who removed the boulder from the roadway. The peasant learned what many others never understand. Every obstacle presents an opportunity to improve one's condition. Life's about removing these obstacles not worrying about it....take care and live well!! You have updated us abt weakness in dollar,euro etc. If rupee goes up by 30% it will wipe our gain in gold as i have invested in INR. There is this famous Dialogue from a John Travoltas film (I guess Face Off)... "Every Problem is an oppurtunity in Disguise"
Wow, I am never so happy as I am today after watching markets go down. I can now understand the feeling while sitting mostly on cash. China down 3%, European market down - Is this the start of Global Crash? Who knows but I think am now becoming a true Happionaire. Waiting for opportunities to come by!! By the way Yogesh, I ordered Cash the crash now. I had read ITHW and found it awesome. I hope this time; i'll be able to cash the crash or atleast try towards it. Thanks for all your guidance and support. I have been very lucky to be a follower of the Happionaire way, because today I am seeing your warnings coming true. When the whole media and analysts were talking about recovery, you were a lone voice who said that worst is yet to come and to benefit from it. Now i want to make most of the crash and I look for your guidance more. Thanks for making millions of us smile and take the right path of investing and life. Anyways ,will give the feedback once i read it.